This is how my mind works: I sat down in front of my computer this morning (my HP mini that is working thank goodness) and thought okay what will I right about today? I came up with nothing. Then I thought I would just give you a list of my current frustrations. I started typing and thought that it would wind up being a very whiny blog so I deleted what I had written and turned of my computer. Something Amazing - that is what I wanted to write. So, I did what I normally do when I am avoid something, I got on Instagram. Instagram led to a post with a book about the funeral industry (which I used to work in) which lead to an amazon search which lead to me wanting to write about my time in that industry which lead to me remembering I was supposed to write about why I blog today. Whew- exhausted yet? Yes, I know that was a killer run-on. The answer to the question, Why I Blog, is pretty much the answer to a lot of whys in my life. 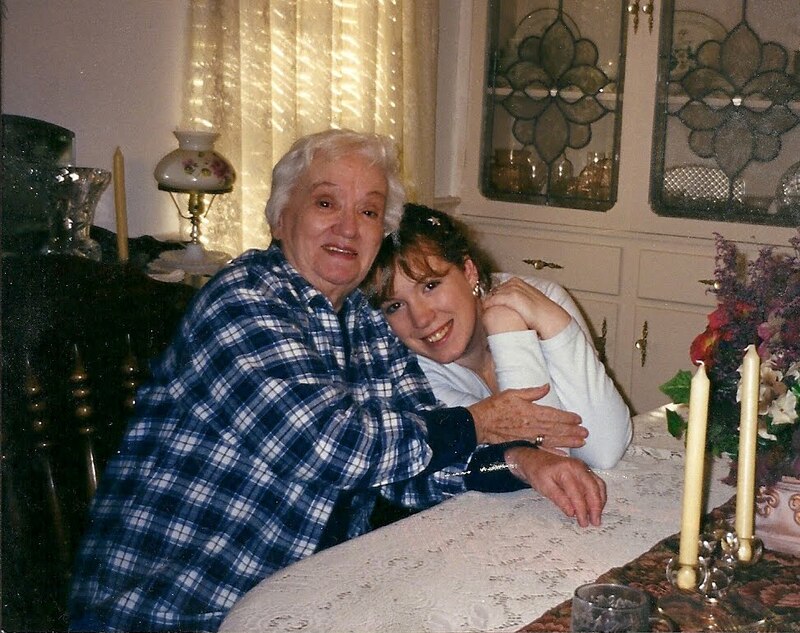 I started writing this blog shortly after my grandmother diagnoses with Alzheimer's. I also started genealogy and making sure every printed picture had a name with a date written on the back. Trust me about that last part you don't want your family members digging through boxes of pictures saying "Who in the world is this?" or "is this Bekah or Morgan?" It is almost a given that I will be faced with the horrible disease of alzheimer's in some shape before I leave this world. Pretty gloom outlook, huh? My maternal family line has been plagued with "hardening of the arteries" now know as Alzheimer's for as far back as I can see. When my father's mother was in the nursing home (she lived to be 96 with all her mental faculties in check) we said over and over that we would record her stories so that we have them. Those good intentions never took place and now what I have is boxes of letters between her and my father and from her siblings. I don't have all the great stories I heard growing up preserved. I think that is what this is all about - preserving memories for my daughters. Documenting their lives, my thoughts on their life and my faith. I want my grandchildren to know how I met their grandfather in my words. I want Shelby to know how I felt to see her be baptized and how much I did behind the scenes to make sure she chose the best friends. I want them to see my ups and my downs - I want them to learn from me even when I am not there. Like the VHS tapes filled with home movies that are packed away in most homes, I want my blog to document our holidays, family vacations and milestones. Even though I've been given the opportunity to start reviewing books via my blog I want to stay clear of a blog that is just full of me promoting products from others because that just isn't part of my mission here. I do blog for other reason, though. I have always expressed myself through written word better than speaking. I have found I'm able to work out my feelings through blogging - that is still a great learning experience for my daughters, right? I also write for you. I love hearing when you read my blog, sorry I had to admit it. My love language is words of affirmation. (if you haven't read Five Love Languages then you better get to Half Priced Books and find a copy - buy used!). I think JAG and Shelby cringe when I try a new recipe for dinner. My love language is sometimes a determent. I sit there during the dinner asking "do you like it?" "are you sure?" "you just said yes, you didn't say you love it." I am working on correcting that quirk some. Okay, let me circle my wagons back around for you. Today as I type this I feel my biggest regret in life is not helping my grandmother document her life before her disease took over her mind. I had time. I vow to not chance my daughters having the same regret. My feelings are so strong on this subject that my mother has started writing her memiours. It may not make the New York Times best seller list, but it will be the most precious gift I will ever receive. I challenge your right now after you have read this to document your life today either through a letter to your child, journaling or a photograph. Male or Female your family will appreciate having an insight on you and your thoughts. You don't have to blog like I do. I strongly suggest picking up one of these three things to get you started. Roses in December - this a spiral book that got when I helped my aunt with an estate sale. I think I was 19 (even then I knew the importance of documenting). I don't think they make this exact one anymore, but they have all different kinds. 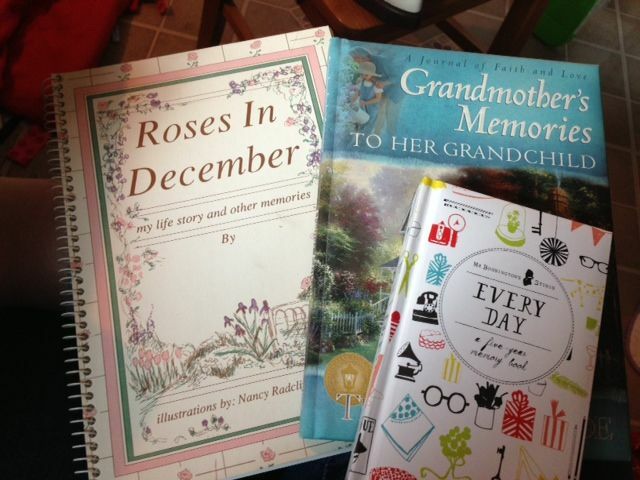 They aren't really a grandmother's or mother's book which I like. Grandmother's Memories to her Grandchild - this one is priceless. This is the book that JAG's grandmother wrote for JAG. I read it before I met her and before I her tour of where she grew up. It was great to know all the stories ahead of time and if you know her you know that she is a pretty straightforward lady and it comes across in her stories about her life. I can't wait to share it with my girls when they get older. Lastly, an everyday memory book. This helps you document once sentence (or two) everyday for five years. I picked this one up at anthropologie, but again you can get them anywhere or make your own in blank spiral. Please, please don't rely on Facebook or instagram to document your life because they may not be around forever. I also know that eventually I'll have to turn this blog into print for my children. And one last strong word of advice - mark ALL your pictures! You don't want people thinking that picture of Aunt Buela is actually Uncle Hank - things happen. I had a picture of my Meme and a woman I thought was her mother...found out it's not - it's her aunt.